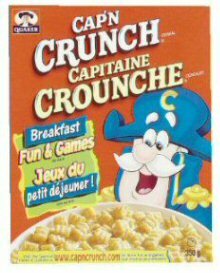 Cap’n Crunch cereal. Sweetened corn and oat breakfast cereal introduced 1963. Flavour developed from a brown sugar and butter recipe served over rice. 0 trans fat. Made by Quaker Oats.